In 2011, the Ontario Liberal government announced the creation of a Local Food Act meant to support and promote food grown in Ontario and allow schools and hospitals to buy more local food. 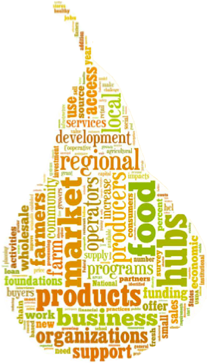 Interested parties, like Sustain Ontario, are currently assembling recommendations to shape this Act, one of which is the development of regional food hubs. This popular concept has gained impressive momentum in the last year, and has been hailed by the US Department of Agriculture (USDA) as at once entrepreneurial, financially viable, and socially conscious (see the recently published USDA study on regional food hubs). Regional food hubs have been widely defined on a spectrum ranging from general geographic areas that have a local, sustainable food culture (the city of Guelph, for example), to actual physical infrastructure that can accommodate the aggregation and distribution of local food (La Montanita Co-op in New Mexico for example). In the middle of this spectrum is the USDA study that defines a food hub as an “organization that actively manages the aggregation, distribution, and marketing of source-identified food products primarily from local and regional producers to strengthen their ability to satisfy wholesale, retail, and institutional demand.” As well, there is the broad definition being employed by Alison Blay-Palmer and her team of SSHRC-funded researchers who are defining food hubs as any critical mass that would help a food system become more sustainable. According to Blay-Palmer it is more useful to keep a broad definition of the concept, as food hubs should be uniquely tailored in tandem with the community’s food system needs. If this means a warehouse where local farmers can store and sell their produce then that is a local food hub. If it means a virtual local food networking site that connects producers, buyers and consumers, then that is a local food hub. The concept of food hubs is so popular because they re-establish farm-to-city linkages, shorten the distance that our food travels, and improve community access to fresh healthy food. The latter is of particular importance because of the alarming incidence of obesity and diabetes in communities without access to fresh food. Food hubs also provide new opportunities to small and medium-sized farms that may not, on their own, be able to produce the volume of food necessary to supply local institutions like schools, hospitals, long-term care facilities, universities and daycares. However, when small and medium enterprises bring their food together in a local food aggregation facility, they may collectively have enough to supply these institutions. Institutional procurement of local food also recycles money back into the local economy and promotes vibrant regions. Based on the wide definition of regional food hubs as entities facilitating sustainable local food systems, there are innumerable examples including Toronto-based organizations like FoodShare and The Stop. However, based on the definition of regional food hubs as facilities acting as a centralized distribution point for strictly local food, there are currently no regional food hubs in Canada. There are however exciting projects in the pipeline including plans for a regional food facility in Durham and one called Organic Central, which hopes to serve Eastern Ontario when it finds an appropriate facility. What remains to be seen is how regional food hubs will operate alongside the existence of the Ontario Food Terminal, the largest produce distribution center in Canada. Will local food hubs simply act as a point of aggregation of local food, which will then be transported to the Ontario Food Terminal because that’s where the buyers are? Or will local food hubs rattle the current food system, redirecting buyers to local food hubs over the Terminal? Lastly, and perhaps most significantly, is it even desirable for local food hubs to be institutionalized in government legislation? Will the Local Food Act empower and propel the concept of food hubs forward, or would they be more successful if they remained under the purview of the grassroots? Alison Blay-Palmer emphasizes that incorporating regional food hubs into the Local Food Act could be a positive step as long as legislation qualifies their existence as locally-developed, sustainable and community-based. Only with these words firmly enshrined in the legislation can we be sure to seize the opportunity that food hubs present to rescale our food system to a place of ecological resilience, economic robustness and community sustainability.